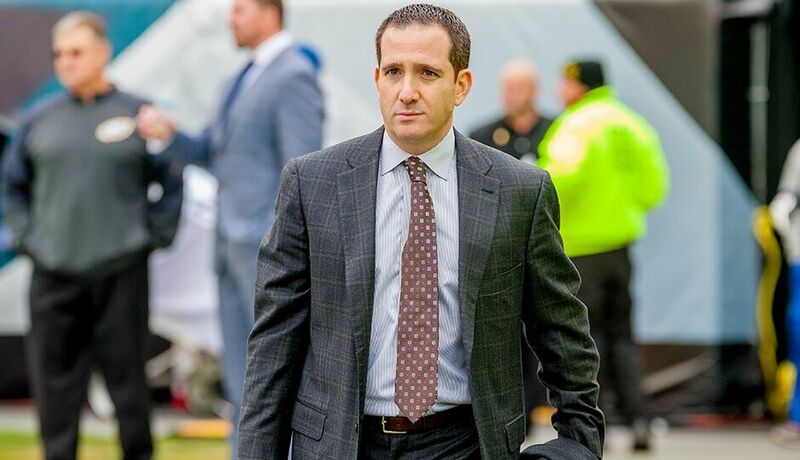 MOBILE, AL — Howie Roseman is back in the personnel saddle after a year of exile, and there is plenty of work to be done. He called it “exciting” to return to the scene and once again be around the people that he’s developed relationships with over the years. Asked if he feels like he’s playing catch-up, Roseman noted that he never stopped watching tape on prospects and said he has trust in the scouting staff. The executive vice president of football operations had the notebook out, pen behind the ear and eyes focused on the North squad as they opened preparations for the Senior Bowl at Ladd Peebles Stadium Tuesday afternoon. The headliner on that team is North Dakota State quarterback Carson Wentz, who seemed to impress on Day 1. The Eagles are in a state of limbo as it applies to the QB spot at the moment. Sam Bradford is set to become a free agent unless they decide to place the franchise tag on him or strike a long-term deal. Roseman was asked for his thoughts on Bradford with the big decision looming. Roseman said the Eagles will approach the draft prep like they would any other year when it comes to QBs. On the signing of Zach Ertz and Brent Celek to new deals. “Two different situations. When you talk about Zach, young player that we drafted, on the come, has tremendous talent, has tremendous work ethic, the type of player that we want to keep in Philly for a long time.